You will now see the first prototype of Resonate, the Twitter client for thought leaders. One of Resonate’s goals is to help you to analyze a Twitter timeline. Our solution to this is to build word clouds from a tweet stream. When applied to your main timeline (or alternatively to any of your Twitter lists), the word cloud shows what’s trending in your world. Alternatively when applied to a person’s tweets, it shows that she is all about and makes it easier for you to decide whether to follow her or not. 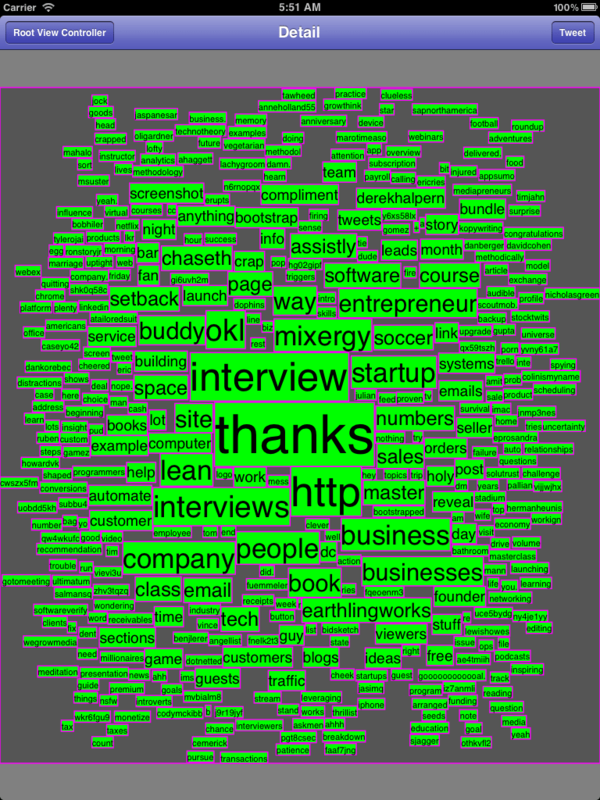 For example, the screenshot above shows a word cloud of @AndrewWarner‘s tweets. You can see from the big “thanks” in the middle that he is a very polite man. Furthermore he also talks a lot about entrepreneurship, business, and interviews. This makes sense since he interviews startup founders and post them on his Mixergy website. Unlike Wordle‘s word clouds, you can select a word in Resonate’s word cloud and see the tweets in the timeline which contains that word. This way, you can quickly find the interesting tweets for you to reply, retweet, or bookmark. If you’re interested, you can signup to be a beta tester or simply get notified when we launch Resonate. Please enter your e-mail address in the form below to get notified when we launch.